Rubber Room Ramblings: OCTOBER IN THE RUBBER ROOM! 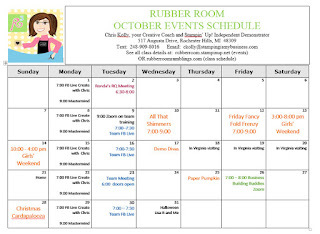 OCTOBER IN THE RUBBER ROOM! 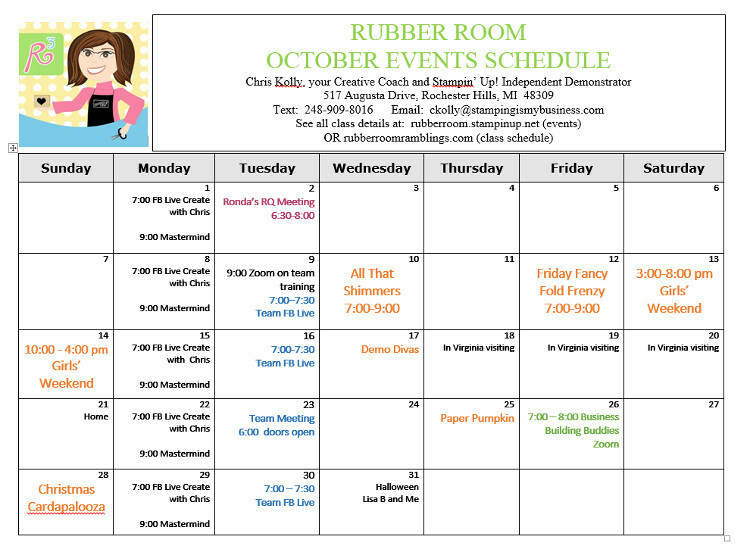 I have put the finishing touches on the Rubber Room October schedule, and I am super excited to welcome Fall. With Halloween, Thanksgiving and Christmas right around the corner, the Rubber Room is the place to be for fun, ink, rubber and friends. Everyone loves a homemade holiday, so let's get started!! You can RSVP with an email to: ckolly@stampingismybusiness.com or send me a text to: 248-909-8016. If you have any crafting needs for the season, let's make a date and have some fun! I would love to help you with party invitations, favors, packaging of those wonderful goodies you bake to give away, etc... whatever your holiday gift-giving tradition, we can add that warm, personal touch that makes your gift even more memorable; that special gift that comes from your heart and is lovingly made with your hands. Want to enjoy a crafting party with your peeps? Set a date, and I will plan and prep for a day or evening you will enjoy so much, it is sure to become a beloved tradition. Need a Girls' Weekend? They are happening once a month in the Rubber Room. You can enjoy completing your own craft items in the Rubber Room while using all of my goodies. That's right, you will have access to my Big Shots, dies, framelits, embossing folders, stamp sets, ink pads, samples, displays, etc... Time to craft and relax and enjoy, AND you know you're worth it! IT'S GIRLS WEEKEND IN THE RUBBER ROOM! HOT HOLIDAY BINGO SPOTS ARE GOING FAST! LET'S BEAT THE HEAT WITH A COOL BINGO DAY! IT'S TIME TO CELEBRATE THE HOLIDAY CATALOG!